I‘ve always been fascinated by history, and in my other (non-SF geek) life I’m actually an historian by profession (I used to be a history teacher, believe it or not). So, for a change, I’m going to recommend not an SF book, but this really fascinating technological history book that I picked up a few years ago, and which has been sitting in my “to read” pile for donkeys ages now. 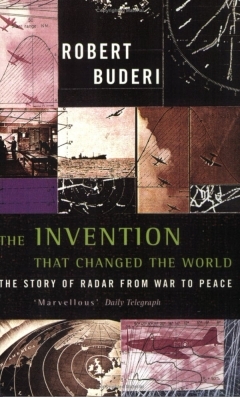 The book is The Invention That Changed the World, written by acclaimed author Robert Buderi. I’ve at last finally gotten around to digging it out for a proper read, and it’s long past time that I did. One of the main things that attracted me to this book is the fact that it not only covers World War II (one of my favourite historical periods), but also does so from a perspective that I rarely see in history books. I have to admit that I’m finding it both unusual and refreshing to read a WWII history from a different, technological perspective, rather than a social or military one, which is what you see in the vast majority of history books. World War II and the post-war period has always been one of my favourite historical eras, and I’ve also always had a fascination for science and technology from any era, past or present. Any book which mixes technology with history has a great chance of being a winner with me. And this one does it in style. So it wouldn’t be too far wide of the mark to say that I’m enjoying The Invention That Changed the World, and I’m enjoying it a lot. The importance and implications of the development of radar and the part it played in the Allied victory during the war simply cannot be stressed enough. It was absolutely pivotal in the victory of the RAF over the Luftwaffe in 1940, and, in the later stages of the war, the non-stop Allied aerial bombing campaign that helped bring Germany to its knees would not have been nearly as effective but for radar, which allowed bombing flights to be continued in all types of weather, day and night. ‘Nuff said. I can’t recommend this book highly enough. Go out and get it from your local bookshop or library, right now. You won’t regret it.